Welcome to my first blog post! I love history and cooking and marrying these two loves has led me to some interesting reads. Namely, very old cookbooks. Luckily, there is a wonderful program at Michigan State University that has put many old cookbooks online. Reading them is a revelation. Cookbooks served many purposes. Not only were they collections of recipes, but also household cleaning and staff supervision. Many authors of these historical cookbooks admonish young housewives to make sure they know how to execute the recipes and not be completely dependent on household servants, as you may not always be able to afford servants. Now, I have no servants. I’m on no quest like cooking every recipe from a particular cookbook. What I would like to do is explore American cooking before it became corrupted by what I like to call the “Food Industrial Complex” or “Big Food”. Processed and “convenience” food have handicapped our ability to feed ourselves wholesome food. When I see a kid eat a homemade chocolate chip cookie and ask what brand it is, I am heartbroken. People used to make waffles, bread and cookies. Sure, in our carb and gluten adverse world, these are fairly evil items. But kids who don’t realize that cookies can be made miss out on the best cookies of all. Nothing beats a homemade chocolate chip cookie out of the oven. Nothing. So, where do I start? Today, I write about a mystery for the ages. The mystery goes by many aliases: Maryland Fried Chicken, Chicken Maryland, Maryland Chicken, and Chicken a la Maryland. I am from Maryland and whenever I traveled out of state and saw some version of this chicken dish on a menu I was perplexed. Sure, who hasn’t heard of Kentucky Fried Chicken or Southern Fried Chicken? My favorite fried chicken is from Popeye’s. But fried chicken “a la Maryland”? Usually anything tagged with “Maryland” as a descriptor meant it either had crab or the “Old Bay” seasonings in it. Frankly, I am probably one of the few people from my home state to really not like “Old Bay”. But, I digress. There are so many recipes for fried chicken, but none is as famous as Chicken Maryland. Strange as it may seem, no two recipes have any similarity when you compare them. Furthermore, there is no other American chicken recipe quite so internationally famous as Chicken a la Maryland. How internationally famous? Well, it was on the menu for the Titanic the day it sank. Keep in mind, Farmer wrote her book in 1892, the Titanic sank in 1912, Escoffier’s Ma Cuisine was published in 1934 and Beard’s American Cookery in 1972. Yet, as a native Marylander I have no idea what Chicken Maryland is. I asked around and I am not alone. How sad that an apparently once famous a dish is so forgotten. After perusing several sources, it seems that Beard is correct, there are tons of versions. Most, however, coalesce around a general idea. The chicken is not deep fried, it’s pan fried, the steamed by putting a cover over the pan. So, the chicken is both fried and steamed. 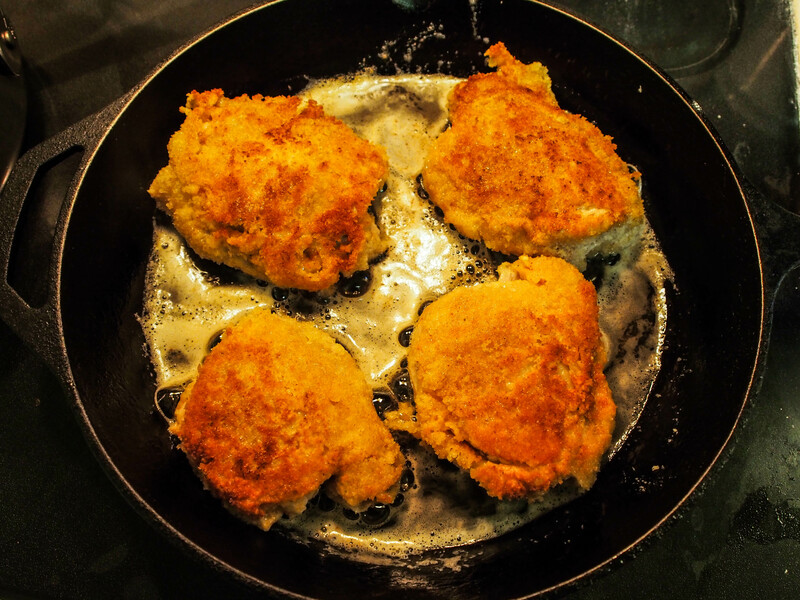 Now, there is general disagreement as to the frying oil (butter, clarified butter, and “drippings”) and the method of breading. To further complicate matters, many of these recipes give a guide as to how to make it, but ingredient measures seem to be something the reader is presumed to know. So, I attempted to resurrect Chicken Maryland or Chicken a la Maryland from the dustbin of history and I must confess, it’s pretty awesome. Crispy and moist without being overly greasy. Why this isn’t the preferred method of cooking over deep frying is really quite a mystery. I like to cook a whole meal instead of just a recipe. 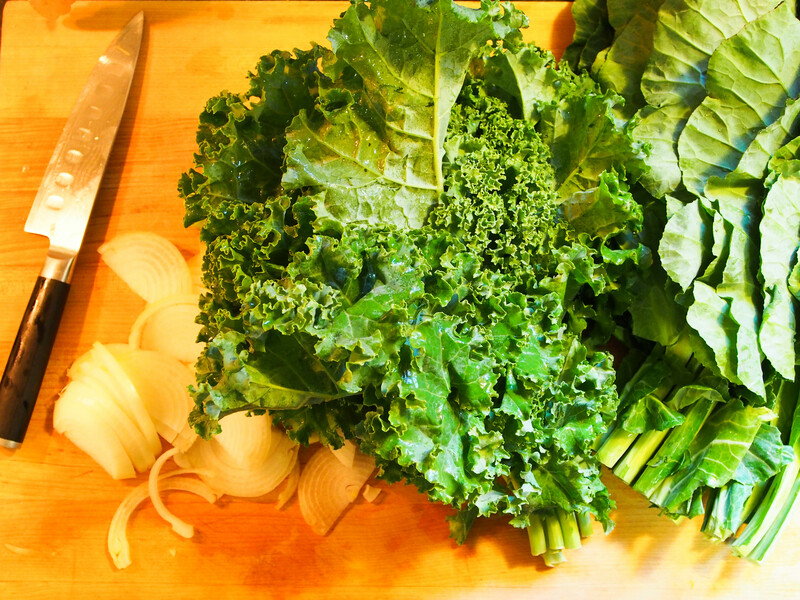 So, to accompany Chicken a la Maryland, I made kale and collard greens (recipe below). My biggest issue with fried chicken is the mess. There’s leftover oil that I suppose I could strain and reserve for another use. But that’s really high maintenance and frankly, I don’t make it that often to keep old grease sitting around. Then there’s the oil splatter all over the stove. Add to that my insecurity over whether the chicken is actually done, and, let’s just say fried chicken in our house is synonymous with “Popeye’s”. Chicken a la Maryland answers every one of my issues with fried chicken. First, there’s no oil and very little mess leftover. The chicken pieces are also “done” with very little effort or clean up. In order to avoid multiple, different cooking times, I bought chicken thighs. They are cheap and stand up well to heat. You could certainly use any other favorite part and have great results. Place chicken thighs in buttermilk and soak for 2 hours. Combine flour, paprika, salt and pepper on a large plate. Combine eggs and water in a wide, shallow bowl. Place bread crumbs on a plate. 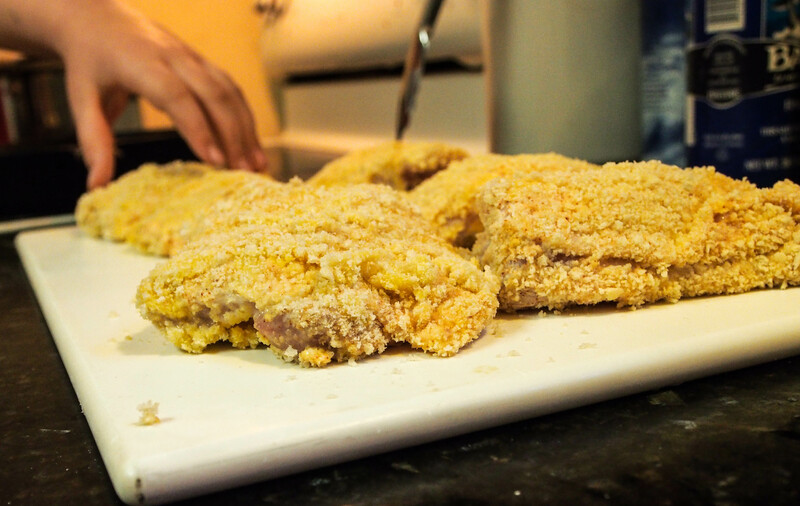 Remove chicken from buttermilk and dredge in flour mixture, then egg mixture, then bread crumbs and set aside. Melt the butter in a 10 inch heavy cast iron skillet. When bubbling, add chicken. Depending on the size of your pan, the chicken may need to be broken up into separate batches. Brown both sides of the chicken. Turn down heat to medium low. With the chicken positioned skin side up, place a lid on the chicken and let steam for 20 minutes, checking occasionally to make sure the bottoms are not burning. Remove the chicken. Add mushrooms to the pan and sauté until soft. Add about 4 tablespoons of flour to create a roux. Cook until the raw flour taste is removed, but not so much that the roux has darkened. Add 1 cup of heavy cream to the pan and whisk. If the cream gravy is too thick, thin with additional cream. Salt and pepper to taste. Serve chicken with gravy and collard greens. I think this recipe would be pretty adaptable to gluten free cooking. 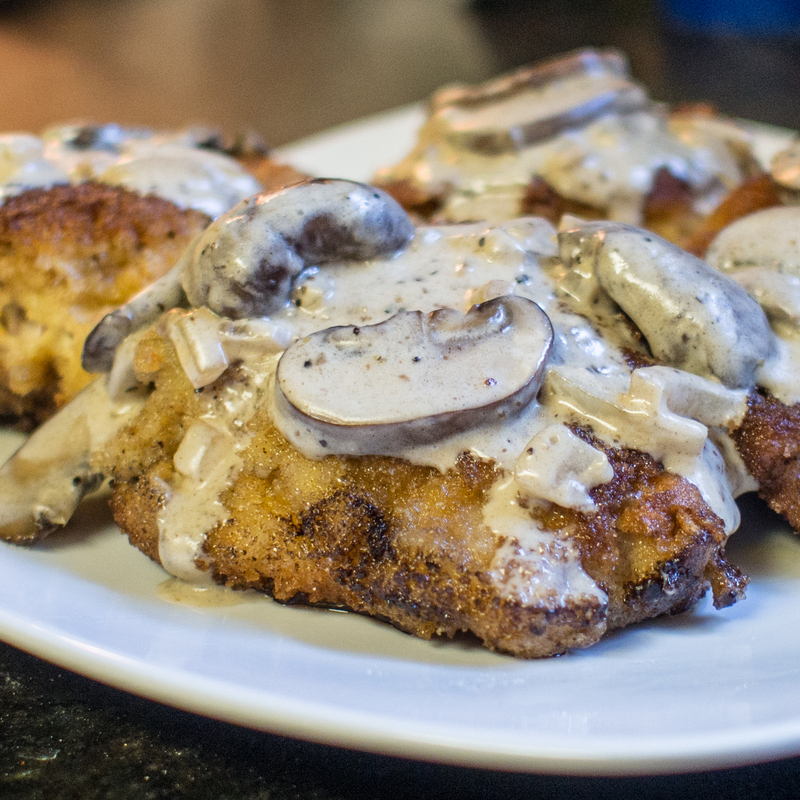 Cornstarch could sub for the initial flour coating and used as a thickening agent for the gravy. Gluten free bread crumbs are readily available as well for the coating. I made this in both a cast iron fry pan and an all clad 4 quart sauté pan. The cast iron pan yielded much better results. The butter didn’t burn and neither did the chicken. If you don’t have cast iron, definitely use clarified butter and be very mindful of the chicken while the pan is covered. You may want to put the covered pan in the oven at 350° F for the 20 minutes, instead of keeping it on the stove. I wanted to highlight the chicken recipe on this post; however, I made the Kale and Collard Greens first, and as it was cooking, made the chicken. The meal was all finished at the same time. In an 8 quart pan, heat bacon grease on medium heat. When the grease is moderately hot, add onions and celery. 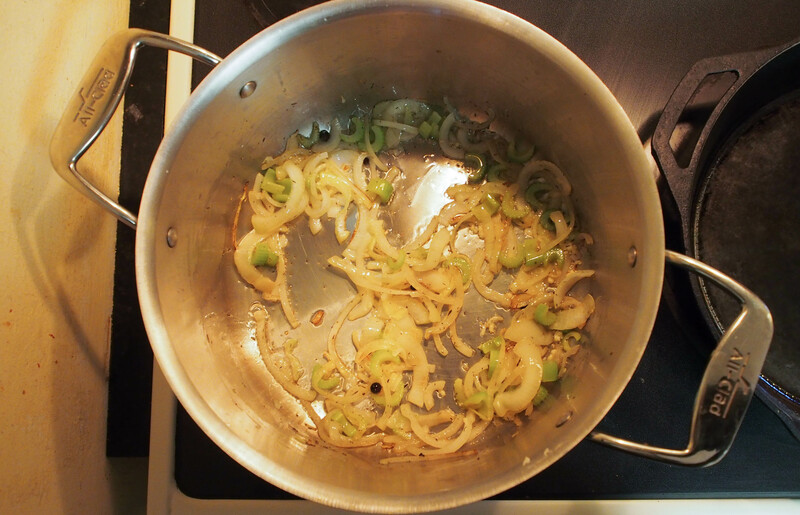 Sauté the vegetables until the onions are translucent and the celery is soft, reduce heat if necessary. Once the vegetables are sufficiently soft, reduce heat to low medium and add the garlic, thyme and bay leaf. Once the garlic and spices and incorporated, but before the garlic burns, add the water and stock and simmer. 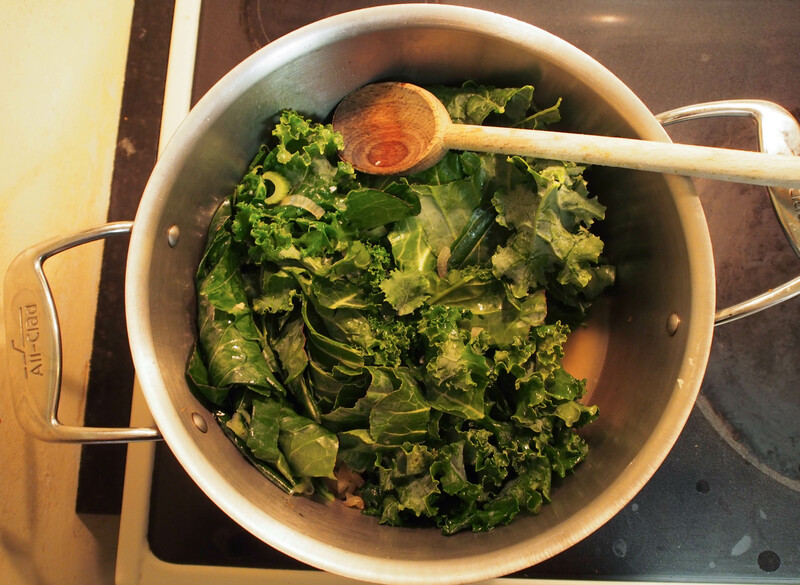 While the liquid is simmering, remove the kale and collard leaves from their tough stems and rinse. Add the greens to the liquid and reduce heat to low, stirring occasionally to wilt the leaves. Cook until leaves are tender, keeping watch on the liquid level. Do not allow the water to completely evaporate, add more water during cooking if needed. Prior to serving, salt and pepper to taste. This entry was posted in Poultry, Vegetable Side and tagged Chicken, Collards, Fanny Farmer, Fried chicken, Kale, Maryland Fried Chicken on March 16, 2013 by dawn of food. Love your first blog,the history,the recipes and the realness of your cooking. keep up the good blogging, I’m a follower!!!!!!!!!! Thank you so much and welcome aboard! !